I believe this is something called 'work life balance' that entails not working yourself until your mental and physical health suffers, not attempting to do the work of more than one person, working off hours voluntarily, etc... I think this is part of a science fiction novel or something because it is laughable to think I could incorporate this into my life. But on a Friday, I just sped away from the shop for a while and hit up an estate sale with the promise of vinyl, on a warm summer morning just a few miles from the shop. 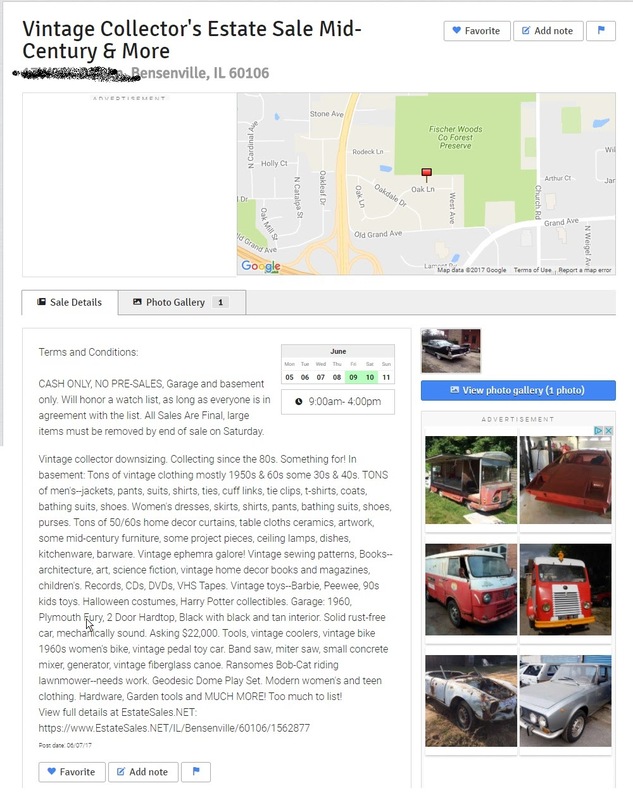 Estate sales always kind of bug me out, I don't have a problem digging through someone's personal possessions when they have decided to share them for their own profit, but when it is someone else's possessions being sold because they are dead, it is a bit morally questionable I feel, for me to profit off of their death. Not profiting in terms of money of course, but by my own personal gain. Then again, I suppose these events earn money for the family to defer the costs of burial and what have you. I have lived and worked in the area my whole life more or less and while I felt I had a firm grasp of the boundaries of Bensenville, I was shocked to find this small pocket off of 83 which felt very much like a rural area from another state. The roads were very narrow, especially so for my large truck and of course it was garbage day. So I was challenged by even more mammoth vehicles. At one point I watched one just reverse down a long and winding side street as it was a dead end and there were no possible way for a tank that large to spin around. In a very cluttered basement with just enough room to maneuver down the stairs, I came across a 16-cube bookshelf which had about 4 1/2 cubes filled with records. I also located an old wooden crate on the floor. The crate was loaded with filler of the worst kind; the bookshelf initially did not prove to be at all superior. But soon after I did start to dig up some country. I gasped audibly when I located the alternate cover to Roger Miller's debut. I have never seen one in the wild and I was even happier to see it was the mono version. Shortly after that I found two copies of Dwight Yoakum's second album AND a copy of his first. I already own the debut but I was very tempted to buy it again as I so rarely see it. I did eventually return it to it's bin but I did not walk away from the follow up. Most regrettably, I also did a catch-and-release on the Del Fuegos debut, a band I know almost nothing about except for the mention in a song of my teenage years, some 90s alternative gold. But as I walked away with two new vinyls and a Pyrex for my girl, I couldn't help but to be satisfied. They weren't going to give me a receipt (they kept them for their records) so I had to ask the cashier to let me take a photo. They indulged me, thankfully.